What do you do when you have a class where everything seems to crash and burn? It doesn’t need to be the end of the world. 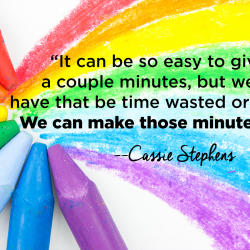 Cassie has 10 tips for you to help everything run more smoothly in your classroom. Listen as she gives advice on how to read your audience, strategies on how to calm your classes, and why a slow transition to quiet talking can be welcomed by your kids. Full episode transcript below. Cassie: I have noticed that there are two kinds of classes and, okay, granted when I say this there’s going to be more than just two times, but if I were going to split my classes into two groups this is how it would play out. There’s the one group where you’re giving instructions, everything is going great, you can tell they’re with you the whole time, they got those directions, you go back over them again one more time just to make sure, you send them all back to their seats, they get to work. Everything is running so smoothly. You clean up. It’s like boom, I am a master teacher. If I hear my name one more time so help me. Let’s talk about how we can make it so there is no more of that second group or at least maybe not quite that much of a disaster because let’s be honest there’s always going to be that second kind of group. But how can we make it so our students really can get started and settled, and get rolling in such a way that they remember the things that they’re supposed to do. They remember the steps. They’re engaged, they’re focused, they’re coming up with their own ideas, and it’s a little bit of a smoother running ship and not so much of a Titanic. So today I thought I’d share with you my ten tips to really making sure that your students are going to have a successful art class. Knock on wood, cross your fingers, I mean lemme just say that these are my ten tips and I been teaching for 20 years and I still have plenty of classes that crash and burn all day long. Multiple times a day. So, take everything I’m saying with a grain of salt you know and, go easy on yourself guys. There’s no knowing what’s going on in the little lives of our little friends and you throw in a full moon and just a wackadoo kind of day and we can only do our very best. So, maybe these are like survival tips for you but take it from me, sometimes when all the stars align, they work. So I’m going to share them with you today. Alright, so tip number one, and this to me is like the most important thing that I think we as teachers need to be really good at doing, and it’s something that I feel like was never addressed in my art teacherin’ classes, and that is being able to read your audience. I used to do a lot of plays when I was in high school, and I was also kind of a speech geek in high school, believe it or not … Yeah that’s more believable than not, I know … And having done those things and been in front of audiences, I was going to say big audiences but let’s be honest, it was a really small high school, I was able to kind of gauge an audience to see what they found funny, what was totally not funny to them, if I was being clear in my tone and my voice and all of that, and those are the kinds of things that I feel as though when I’m a teacher I really bring that to my teaching. And I can tell when I’m starting to lose my kids, and I can tell when they’re getting antsy or bored, and we need to stand up and stretch, or really just zip through whatever I’m talking about and get to the creating part. And I think as teachers it’s natural to be able to see that and be aware of it but then you’ve got to make sure you act on it. If the kids are getting antsy, squirrelly and bored, don’t take offense. Maybe it’s a lot for a little five to seven year old to sit and listen to us chat about one artist or another. Maybe we do need to wrap it up because if you’re like me you’re a little too chatty and you need to get on with it already. So being able to read your audience, know when they are starting to lose focus, and be less engaged is very important. Take note of that, scrap what you need too, change what you need to, and move on and never ever take offense to that. Now I’m not saying by any means to allow kids to get away with behaviors that you wouldn’t accept in your art room. If they’re rolling around on the floor or shouting out of course those are behaviors that you have hopefully established that are not appropriate for your art room. So by no means am I saying you should start to let your students get away with things that you wouldn’t allow, I’m just saying to be a little bit more aware of whether or not you actually have captured and gotten their attention. Okay, speaking of ill-behaved children, it’s always important when you see them doing the wrong thing, to remind them of your expectations. For example, I can kind of read the tone of a class when they’re walking into my room. If, as they’re walking into my room and we’re doing our greeting which is when I say, “Hello my most amazing artist,” and they say, “Hello my most amazing art teacher,” if I’m getting a really great response to that and they’re walking in and they’re filing in, in the rows … I have my students sit in rows, on the floor where I’ve made little lines of tape so they know exactly where to sit, and if they’re filing incorrectly as we’ve learned, and they’re sitting correctly as we’ve learned, and I know that they’re all facing me and not having little sidebar conversations, I know we’re off to a great start. However, if I’m not seeing those behaviors, if I am seeing kids, moving, scooting around on the floor or not sitting correctly or chatting, then by golly you better believe I’m going to have them stand up and we’re going to try it again. Because if you let your students come in, in a way that you’ve established is not appropriate and then you try to carry on your lesson from there, it is going to be a constant uphill battle. So, not only do you need to read your audience but you also need to make sure to remind them of those expectations, especially as we get towards the fall, fall break, things are getting a little bit looser and them kids are getting a little too comfortable. Alright, here’s my third tip, if they’re coming in and you can tell that they are a little bit, let’s just say excited, and hey I’m always thrilled when they’re excited but you guys know when there’s excited and then there’s a little bit too excited. My students come to me a lot of times from P.E. and so when they’re coming to me from P.E. they’re usually a bit warm and hot, and stinky and sweaty from their activity, and sometimes they’re still a little excited from whatever they’ve done and for those classes I know that I might need to spend a moment getting them to calm down and to focus. Or I’ll have those other classes where maybe they’re coming from somewhere other than P.E. or maybe they were doing something else where they’re not very excited. I can just tell the mood is just kind of “Meh.” It’s, maybe the afternoon classes usually is when the “Mehs,” hit, and I need to get them excited and energized because come on guys we’re in art class now, what better place is there? So I feel as though it’s really important to spend those couple of minutes not only reading your audience, reminding them of expectations, but also either calming them down or getting them juiced up. So, how do you calm them down? Well, one of my favorite ways to calm kids down is just by using my tone of voice. All I do is I drop it down a little bit lower, I talk a little bit slower, we might talk about taking a breath in, and letting it out and with maybe just my tone of voice I might even dim one of my lights just to kind of bring them down a little bit. There’s also something called palming that I’ve talked about before on this podcast and on my blog, which is where you can have your students rub their hands together, place their warm hands over their eyes and just take a moment to breathe and relax and bring the mood down. If your students are kind of coming in, in the “Meh,” kind of manner, then my favorite way to energize them is to get everybody to stand up, and we’re going to do a silly dance, or we listen to one of our videos on YouTube like the ROYGBIV Rainbow Song or the Scratch Garden Line Song, just something to kind of lighten the mood and get them excited. Alright, once my students have sat with me and we’ve all got the ball rolling and have gone over all that we’re going to be covering today, I know I have talked a lot about call and response. Call and response is my favorite way to remind my students of what they’re going to be gathering at quote, “The Store,” my little supply area, and also for them to remember the steps of what they’re going to be doing, and then cleanup procedures. Definitely if you’re not familiar with Call and Response, check out my podcasts about that, I’ve also gotten, or I’ve also shared recently a lot of videos on my YouTube channel of me teaching and you’ll see me use Call and Response with my students all day long. It’s almost like a nervous tick how much I use it but trust me if your students are saying along with you all of the procedure, steps they’re going to be doing, they will more than likely retain it. Okay, so this is something I started doing recently and I really love it, within the last year or so, and when I dismiss my students to go to their seats to get creating, I don’t dismiss them all at once. I usually have my students go and gather supplies at what I call The Store and when they gather their supplies they usually get the supplies in lines, or if I’m passing back artwork they go and get their supplies from the store one at a time. Dismissing my students to gather their supplies in either rows or one at a time really helps to slow the pace of how many students are over at my supply gathering table, which is good. My students know that they have to go to that table in some sort of line. They’re not to be a mob of mad artists over there grabbing brushes, and paper, and pencils, and whatever. So, making sure that you have a procedure to dismiss your students to either gather their supplies or go to their seats is really key and making sure not to have them all dismiss at once but either by rows or by individual students, will really slow the pace down and make sure that your students aren’t distracting one another and getting straight to their seats and getting straight to work. I also, recently started doing this within the last year or so, which is using my time timer. If you don’t have a time timer, that’s literally the name, you might want to check it out but you could also just use a stopwatch function or even a timer function on your phone. Why I like my time timer is because it’s a giant timer, and it’s a huge visual for my students to see how much time they have left, either during art class or in this case we always have five minutes of silent start to art. And I love having my students start art for the first five minutes silently because it does the following, it eliminates distractions, there’s no chit-chat between friends because we’re not allowed to, it really helps them focus on what they’re doing. They have those first five minutes to remember, “Oh yeah I gotta write my name on my paper, oh yeah I’ve got to think about the steps.” They can’t talk to their neighbor and ask them what they are so they literally have to stop and use that thing between their ears to figure that out and for that reason, it helps them to have a better recall of directions. Five minutes of silence means I’m also not speaking and they are not allowed to ask me any questions. I’ve noticed that when I first started this they were allowed to chat with me and I noticed that their just knee-jerk reaction instead of stopping to remember the directions would be to ask me, and I realized they were using me as kind of a crutch or they just wanted to talk, and by also making it so I had five minutes of silence really helped everybody stop, think, and focus. Another thing I like to do, that I feel like really helps my students dig in deep and really do a great job at creating is having all of their supplies easily accessible and what I mean by that is this, when my students are painting I have four students per table. I have two on one side, two on the other, and in between each two kids are the supplies that they’re using. So if they’re using paint, in between each two students there’s a tray that has a water dish and all of the pain they would need. If they’re using oil pastels then in between two students there’s the oil paste pack they happen to be using, or whatever other supplies. I am never a big fan of having just one set of supplies in the middle. I’ve noticed that my students when they have to do a lot of reaching or grabbing it’s just one more distraction for them and I’ve noticed that they like to have things really close at hand. Think about how you like to work. You don’t want to have to be stretching across the table to grab your supplies and I’m guessing your students don’t want to either. The silent five minutes, I’m going back to that, really helps me also with my younger students. So in my art room I have these plastic chairs, they’re fine, whatever, but they’re really hard for my littles, especially my kindergarten and first graders to scoot their chairs in, and this kind of ties in with the whole reaching for supplies. My kindergarten students would literally have to get out of their chair, push their chair in, and then kind of squeeze themself into the chair in order to get it to be pushed up close enough to reach everything. So, just another, like, plug for the five minutes of silence. Now, I don’t know how you run your art room. You might like your students working silently. You might not mind them chatting. I really think it’s a personal preference. I think it’s up to how you want to run your art room. I don’t feel like there’s any right or wrong way as far as noise level goes for you in your art room. It’s like what you’re comfortable with. Me personally, I like my students to work quietly, but I totally don’t mind after the five minutes of silence are up if they talk softly. I’ve just noticed that there is not softly switch on most children. So I will play soft music and as soon as the five minutes of silence is over, or sometimes during that five minutes of silent time, I love to start playing soft music. My favorites right now are the Harry Potter theme, soundtrack I guess is the word I’m trying to say. Anything from the Piano Guys is great. I also love audiobooks and reading out loud to the kids, which I’ve chatting with you guys before about. But, I honestly think that if you’re trying to decide, do I want to let my students talk? Should I let them talk in a loud or talking tone, should I ask them to talk in a soft tone, should I make it where they’re not talking at all? If you’re trying to decide, why not spend just a couple of days observing or just even one art class. Have them work silently for five, and just see how they’re working, and then open it up to soft talking. Are they still engaged and then just talking every now and then? Have they put their supplies down and they’re just like completely full-blown engaged in a conversation with their neighbor? And what do you want them to do? Like maybe that conversation with their neighbor is something about what their creating. Nine times out of 10 it ain’t, I’m just going to say it right now, but it might be. So, how you run your art room is totally you. It’s on you. And you could even ask the kids. 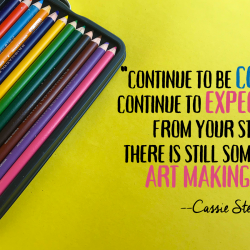 I think you would be surprised to learn that a lot of your students actually really relish, enjoy, love, crave that silent art time, because it’s just a time for them to be with their own thoughts and their own creating experience. But like I said, I feel like that’s a teacher preference and it’s something maybe you and your little artists can decide together. And I also think that having that slow introduction to talking, that fade out of silent art class is a good way to help them ease into creating and kind of working quietly, knock on wood, fingers crossed, at the same time. Now, again, like I said, these are my ten kinds of things that I do to help my students really focus, work, work mindfully, come up with original ideas, create their best work, and be proud of their work. 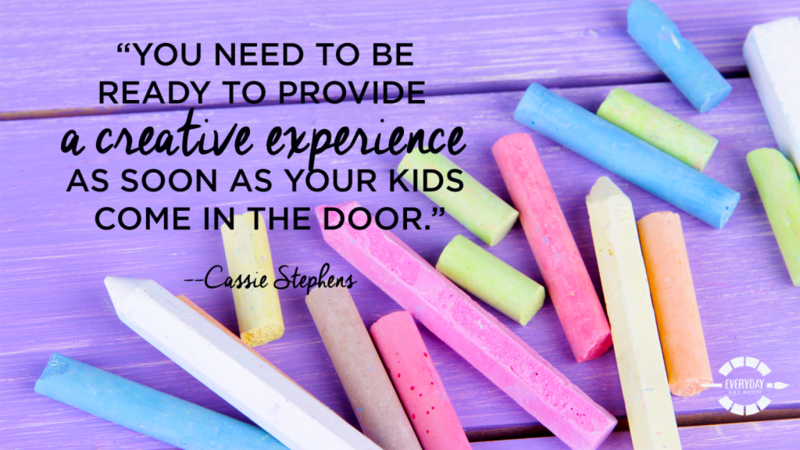 And I think that those things are really important to your students’ creative experience and it honestly does start the minute they walk in the door. You gotta be able to read that audience, figure it out, you’ll know it I guarantee the next time your students walk in the door, read that audience and trust me, go from there. Bring it up, bring it down, keep it calm, allow them to chat, it’s up to you. Thank you so much guys for letting me share. Tim: Hello this is Tim Bogatz from Art Ed Radio, just a quick reminder that you can find all things related to Everyday Art Room on the Art of Ed website under the podcast tab. You’ll find the full transcript of every show, links to Cassie’s blog, AOE articles and other resources that can help your teaching. It’s all at the artofed.com under the podcast tab. You can also sign up to receive weekly emails whenever a new episode is released. Now let’s get you back to Cassie as she opens up the mailbag. Okay, my go-to paintbrush always and forever are Royal Langnickel. Ya’ll I’m not affiliated with Royal Langnickel but there ain’t no paintbrush like a Royal Langnickel paintbrush. Can I get an amen? I mean have you tried them? The green handled ones are my favorite, every two years, so basically every other year, I order a huge class set and when you get a class set of the green handled ones these are rounds, round brushes, they come with a pretty big brush all the way down to a teeny weeny tiny one and we love all of them and they work great. Their hairs don’t fall out, I can’t say enough good things about this. Royal Langnickel also makes some red handled flat brushes and some yellow handled, I guess they’re kind of a flat brush too, those just don’t do it for me as much as the green handled ones and they work beautiful for watercolor paint, for acrylic, for temperate, you name it. Now, if you want a really big brush you’re definitely going to need to get some of those bristle brushes. But I hate those brushes. All they ever seem to do is scrape and scratch the paint right off the surface. So green handled Royal Langnickel brushes, those my jam, and I can’t obviously say enough about them. Oh honey, I don’t. No way, okay. So in my room, I have three sinks, they are all at adult level which is fabulous, genius, thank you for making me have sinks that kids can’t reach. So smart. So I have three step stools, but to be honest, I have thirty minute art classes, I don’t have time for my friends, especially my little people to go to the sink and wash their hands. So, unless it is a ton of paint, or you know something extremely messy, if my students get paint on them I usually just am wearing an apron, if they say, “Oh I got paint on me,” I usually just take their hand and wipe it on my apron or worse comes to worse I’ll just say, “Go wash your hands at the sink.” But most of the time I tell them to rub their hands together really fast and now they have, bam, rainbow lotion which you can wash off in your classroom. I haven’t had too many complaints from the classroom teachers about this one either and my students if we’re painting normally wear aprons, which they can just wipe their hands on their apron. My older students, if they need to wash their hands they can go was their hands. I mean they’re in third and fourth grade, hopefully, by now they know how to use the sink and wash their hands. Although you know, never be surprised, they always take me by surprised every now and then when so and so is over there up to their elbows taking basically a bath in my sink. First of all, I am so sorry for your loss, your school’s loss, the loss of just lives and things, and objects, all those things that can be replaced but I know it’s like devastating for your kids and for your students and so I think the main focus would be to have lessons where the kids can feel successful and be happy with their successes. I would strongly recommend, if you can access Art Hub for Kids, I think all students respond so well to Art Hub for Kids and they really enjoy drawing along. That being said, if you don’t have access to it, then create your own draw alongs, meaning stand at the front of the room and do a guided drawing with your students and I think having them do a guided drawing of something familiar, something comforting, perhaps a favorite cartoon character, or a landmark, or just something happy like a rainbow with a smile, anything that they can be successful at and take home with them, something that will bring them joy, I think that is your very best bet where everybody will feel happy and successful, and I feel like guided drawing allows that, especially in a situation for this, like this. Thank you for your questions, if you feel the need to throw a question my way then what are you waiting for, do it. 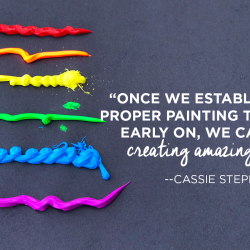 You can find me at The Everyday Art Room, at the Artofed.com. In high school I was hands down the worst student an art teacher could ask for. I was distracted and distracting the entire time I was in art class. I thought of art class as like my social hour and I would just kind of bounce from table to table, keeping other people from doing their work, and my art teacher didn’t seem to mind too much. I’m sure it drove her crazy now in retrospect, but I did all of my work at home. And I had it in my mind because of this that I could only create in the calm and the quiet of my house and in my bedroom, and that I was never going to be able to create while surrounded by friends and I don’t want that to take place in my art room. I don’t want my students to ever think that my room is just this place where we goof off and we don’t create. And I think it’s important for us to let kids know that yeah art is fun, but it’s also some serious business. And how else can you reinforce that than by holding your students accountable, making sure that they are calm, most of the time, quiet, it’s up to you, but definitely focused and creating. I’m Cassie Stephens, thanks for joining me guys.